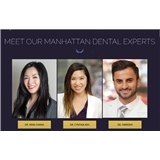 Dental Serenity of Manhattan, P.C. (New York) - Book Appointment Online! Dental Serenity of Manhattan, P.C. We take major insurances! We are excited to meet you and welcome you to your dental home. The visit was perfect and the doctor fantastic, he did a great job, I felt no pain and I was perfectly aware of what was happening as everything had been previously explained in a very clear and coincise way. Dr. Keh is very nice, keeps me calm, explains everything thoroughly. she also takes her time and makes sure I'm aware of everything she's doing. Excellent as always. Staff are friendly and welcoming. I mean I’m willing to pay out of network for this dentist!